A BUYER has purchased $14 million worth of property in a single transaction at Kokoda Property's $119 million Ella development in Newstead, Brisbane. This purchase follows the project launch in late November, when $22 million in sales was transacted at the development. The $14 million buyer purchased a complete floor, plus three additional apartments on a separate level in the luxury development. The project's first stage, Chester, had a slow start earlier this year, but in recent months, sales have picked up - there have been $95 million in sales in seven weeks - and Kokoda has brought forward the release of the second stage, Ella. Kokoda Property sales and marketing director, Sam Tucker says buyers are becoming more discerning in the Brisbane market. Tucker says the buildings, designed by world-renowned architecture firm Hayball and interiors by award winning Singapore Ministry of Design, offered something novel to Brisbane. "We did extensive research to identify gaps in the market and to really understand where the market is moving in order to develop a luxury project that seamlessly connects with Brisbane's culture and lifestyle," says Tucker. "Kokoda's heritage lies in high-end luxury so this narrative carries through our brand into all our projects. Continuing this history is extremely important to us as this high-grade offering lies at the core of the company's value proposition. We engage the best architects and interior designers from around the world to ensure that we are market leading and cutting edge." Tucker says that the benefit and ultimate value in high quality developments is two-fold. "A higher quality offering attracts tenants and investors that are willing to pay a premium," he says. "Secondly, these developments are more likely to see stronger capital growth than their lower grade competitors purely on the basis that quality will stand the test of time. Without a doubt, the majority of our developments will see strong capital growth within the period they're sold to when they are settled. "The market is realising that true value lies in higher grade product rather than the investor stock that Brisbane was focused on seven to 10 years ago." 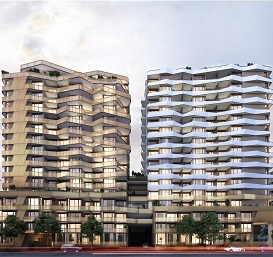 Tucker says Kokoda's commitment to the Brisbane market is long-term, with the luxury developer currently in due diligence on another project. "The demand is definitely there but it all comes down to finding the right site and investing heavily into designing the right project that will meet the demand," he says. Ella's one and two bedroom apartments range in size from 55sqm to 82sqm and are priced from $440,000. Three and four bedroom penthouses range in size from 145sqm to 197sqm and are priced from $2.3 million. Completion of the project is expected in 2018.